With the Christian holiday season upon us, and the inevitable media coverage of the so-called “war on Christmas,” it’s worth remembering Lynch v. Donnelly (465 U.S. 668) — a US Supreme Court case from 1984 in which the city of Pawtucket, RI, was sued over the annual nativity scene that it erected, at (admittedly minimal) public expense each year in the downtown shopping area. The city of Pawtucket, R. I., annually erects a Christmas display in a park owned by a nonprofit organization and located in the heart of the city’s shopping district. The display includes, in addition to such objects as a Santa Claus house, a Christmas tree, and a banner that reads “SEASONS GREETINGS,” a creche or Nativity scene, which has been part of this annual display for 40 years or more. Respondents brought an action in Federal District Court, challenging the inclusion of the creche in the display on the ground that it violated the Establishment Clause of the First Amendment, as made applicable to the states by the Fourteenth Amendment. The District Court upheld the challenge and permanently enjoined the city from including the creche in the display. The Court of Appeals affirmed. 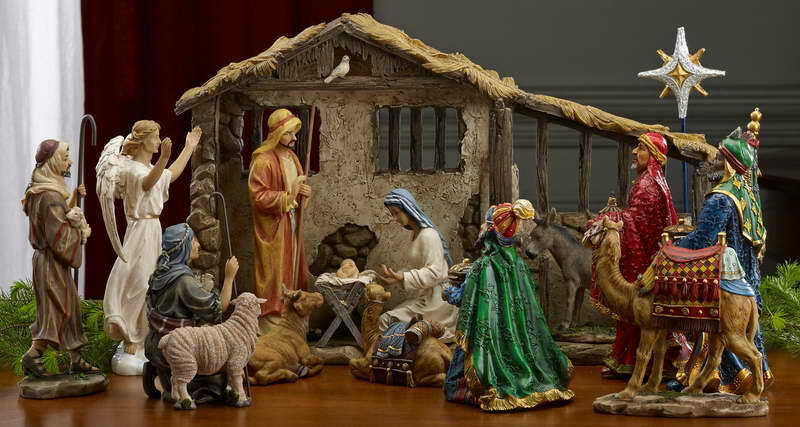 The majority of the Justices disagreed with the lower court, however, and saw the crèche display (from the French for nursery [see pictures of the scene, used as evidence in the case, here]) as perfectly fine. the city has a secular purpose for including the creche in its Christmas display and has not impermissibly advanced religion or created an excessive entanglement between religion and government. The display is sponsored by the city to celebrate the Holiday recognized by Congress and national tradition and to depict the origins of that Holiday; these are legitimate secular purposes. Whatever benefit to one faith or religion or to all religions inclusion of the creche in the display effects, is indirect, remote, and incidental, and is no more an advancement or endorsement of religion than the congressional and executive recognition of the origins of Christmas, or the exhibition of religious paintings in governmentally supported museums. So, it’s a victory for religion over the forces of secularism, right? Not only does the Court’s resolution of this controversy make light of our precedents, but also, ironically, the majority does an injustice to the creche and the message it manifests. While certain persons, including the Mayor of Pawtucket, undertook a crusade to “keep ‘Christ’ in Christmas,” … the Court today has declared that presence virtually irrelevant. The majority urges that the display, “with or without a creche,” “recall[s] the religious nature of the Holiday,” and “engenders a friendly community spirit of goodwill in keeping with the season”… Before the District Court, an expert witness for the city made … a similar, though perhaps more candid, point, stating that Pawtucket’s display invites people “to participate in the Christmas spirit, brotherhood, peace, and let loose with their money”… The creche has been relegated to the role of a neutral harbinger of the holiday season, useful for commercial purposes, but devoid of any inherent meaning and incapable of enhancing the religious tenor of a display of which it is an integral part. The city has its victory — but it is a Pyrrhic one indeed. It is not difficult to imagine people who believe that such symbols as — in this case — the nativity scene are uniquely and deeply meaningful and therefore ought to be set apart from mundane matters of day-to-day life (like the economy). The so-called separation of church and state, then, is not necessarily a conspiracy foisted upon the public by godless liberals, as we sometimes here in some parts of the media, but, instead, is for some a necessary strategy to ensure that what they hold to be sacred is not diluted or polluted by the secular. From their point of view, allowing the Christian manger scene into the public square, at public expense, requires us to “relegat[e it] to the role of a neutral harbinger of the holiday season, useful for commercial purposes, but devoid of any inherent meaning” (to quote Blackmun) — which, for them, is a poor testament to what they argue is the special character of these special symbols. And so voila, the separation of church and state can be understood to serve deeply religious interests. This entry was posted in Faculty Blog, Relevance of Humanities, Religion in Culture and tagged Christmas, Church and State, Creche, First Amendment, Lynch v. Donnelly, Manger, Nativity Scene, Pawtucket by Russell McCutcheon. Bookmark the permalink.